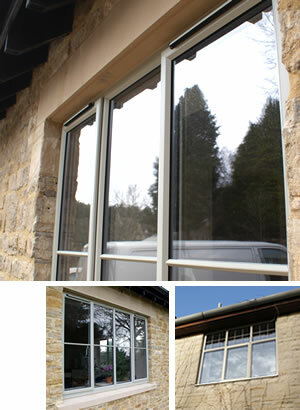 Aluminium has evolved over the years, becoming a sought-after window material thanks to its sleek, sophisticated looks. Multiple benefits for homeowners are making aluminium an increasingly popular choice for new windows, and converting more installers to aluminium installation in the process. Aluminium windows are slimmer than uPVC and timber and homeowners are sold on the barely visible sightlines. Other selling points include aluminium’s strength and security, polyamide thermal breaking technology for energy efficiency and its long life and low maintenance. This simple window is the most popular double glazing option for replacement windows in residential properties or for new builds. Casement windows are a versatile option, available in a range of configurations, including top or side hung, or fixed light (non-opening). Learn more about the product specifications for our aluminium casement windows. Heritage aluminium windows are the modern-day equivalent of steel-framed or crittall windows, but compliant with today’s highest security, weatherproofing and thermal efficiency standards. With slim sightlines and large glass area, these windows are a popular choice for architects and consumers alike, for a range of heritage, renovation and refurbishment projects. Learn more about the product specifications for our Alitherm Heritage windows. A perfect match for period properties such as cottages, churches and other buildings with stone facades, our stone mullion windows combine the functional and energy efficiency benefits of modern double glazing with traditional aesthetics. Learn more about the product specifications for our aluminium stone mullion windows. Sliding windows open by pushing the window sash to the side rather than outwards. These are ideal for replacing windows where projecting or outwards-opening sashes could be hazardous, such as when opening onto corridors or pathways. Although these are similar to sliding doors, the frames are much slimmer. Learn more about the product specifications for our aluminium sliding windows. Probably the most versatile window in our range, tilt and turn is a popular option for the upper floors in buildings where safety is key. This slim double glazed window tips backwards to allow for ventilation, but opens outwards for ease of cleaning or as a fire escape window. Other variations include reversible windows and pivot windows for a more flexible swivel out option. Learn more about the product specifications for our aluminium tilt and turn, reversible and pivot windows.